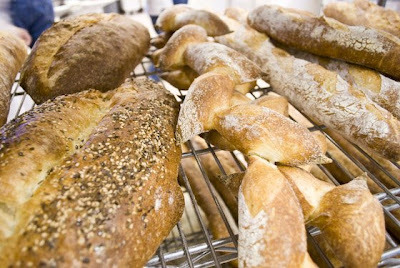 From left to right: A split seeded batard, epi (shaped to look like a wheat seedhead), and baguettes. It was a grueling schedule that ultimately proved unsustainable, but I really enjoyed my time in the bakery. There's something deeply satisfying about those cooking smells so early in the morning, and about being the "they" that actually gets up way before dawn to do that thing that "you" don't have to do. It felt productive, useful, and natural. Scored batards look a little gruesome. But since my three hours in the bakery were the first three hours of the baking day, it usually meant that most of my time was spent mixing doughs and getting them into their first rise. 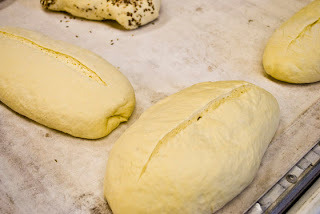 I almost never saw any of the doughs I mixed actually come out of the oven, and I rarely shaped the doughs into the boules, baguettes, and batards that rest for the final rise before baking. My shaping skills stayed clumsy, and I felt self-conscious if I was asked to do it -- pretty much the worst way to feel if you're trying to execute a complex manual task with any kind of fluidity and dexterity. The dough reacts to self-consciousness by sticking to your hands and the bench, refusing to come together, and conspires to make you look even more hapless and ridiculous. These are the thoughts that go through your head at 6 AM. After I stopped at the co-op, I pretty much stuck to boules in my home baking. But I dreamt of baguettes. 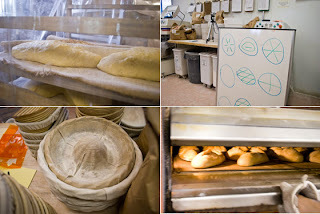 Clockwise from top left: Batards rest; scoring patterns, diagrammatically; loaves, doing their thing; a toral banneton looks like a little sombrero. 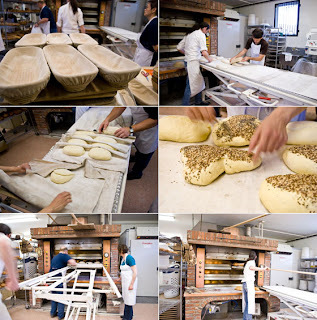 Clockwise from top left: Batard bread forms (banneton), lined with linen; turning dough out onto the oven loader; seeded shapes; unloading the oven with a ten-foot-long peel; in goes the bread; batards rest in their linen couches. So then there was the Dough Shaping and Scoring Practicum at the King Arthur Baking Education Center. Its fussy and technical name appealed to me, and I thought it would be a good confidence booster as it promised pounds and pounds of dough on which to put the Practic in Praticum. Then later, I suppose, the yum. It did not disappoint. We seven practicants spent Friday evening preparing pre-doughs and looking at slides of happy bakers holding beautiful breads, then the entirety of Saturday shaping our way through about 15 kilos of dough each. About 30 loaves. We worked through many cool shapes that often used a clever topological trick to produce some fun hunks of bread. I folded a wet, table-sized blob of dough up like an old comforter. I tossed and turned all night trying to think of the perfect stencil through which to dust flour on the tops of my loaves. I spoke up and pointed out an error in one of our handouts. I cannot say that I produced perfect baguettes, but I got to the point where I could do it without thinking about what I was doing wrong -- which, for me, is one of the first steps toward actually doing something correctly. 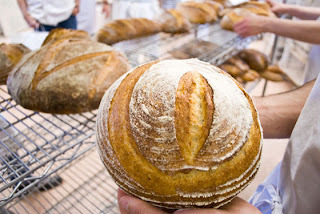 Happy baker holding beautiful bread: a finished boule, ridged from the banneton and scored with a petal scoring pattern. It was a nice couple days. I will be back in June to learn about croissants.